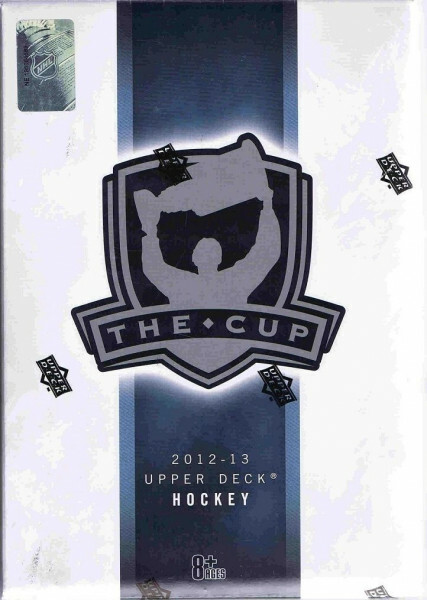 Factory Sealed 2012/13 Upper Deck The Cup Hockey Hobby Box mit 1 Pack a 5 Cards per Pack + 1 UD Ultimate Bonus Pack ! Every Box contains Two Autographed Patch Cards and One Signature, Memorabilia, or low numbered Parallel!! The Two Autographed Patch Cards consist of One Signed Rookie Patch and a second Signed Patch Card showcasing an NHL Star or a Rookie in a collectible insert! Each Box contains One 2-Card Ultimate Collection Bonus Pack! Find One Autograph or Mmeorabilia Cards inside each Bonus Pack! Produktinformationen "2012/13 Upper Deck The Cup Hockey Hobby Box NHL"
- Autographed Rookie Patch Cards #'d to 99 - Mega-Hits! - Property Of ... Stick Cards - Awesome 1-of-1's! - Autographed Draft Boards - get 'em while you can! - Program of Excellence, Singles & Must-Have Duals! - Autographed Draft Board & Patch Booklets! Weiterführende Links zu "2012/13 Upper Deck The Cup Hockey Hobby Box NHL"
Fanbewertungen für "2012/13 Upper Deck The Cup Hockey Hobby Box NHL"